There are two things about our food supply that really underscores the fact that we are indeed still a third world economy. The first is the incredibly erratic supply of produce and other grocery items, and the second is the incredibly variable pricing for the same exact item. The main reasons for this annoyingly crappy retail environment? Consumers that are neither quality nor service conscious, nor as a group possess enough buying power to sway the retailers, lousy distribution capabilities, non-existent proper storage facilities, a lack of real competition and virtual monopolies or oligopolies for vegetables and fruit, tons of red tape associated with importing a head of celery, local growers hit with all kinds of costs on their way to the markets, and the list can go on and on. Bottom line, compared to many of our neighbors, we have unbelievably limited choices, erratic availability and bizarre pricing. Donâ€™t get me totally wrong, things have improved dramatically in the past 10 years, but we are decades behind other similarly situated and economically positioned nations. What brought this on? Capsicums or sweet bell peppers, plums and Charmin toilet paper, of all things. Okay, I admit this isnâ€™t a rant on the lack of rice, cooking oil or patis, but it is a valid point nonetheless. For many years, I bought very expensive imported multi-colored capsicums when I first moved back to Manila. They are a staple in my salads and antipastos and I love them. At the time I used to pay roughly PHP350+ per kilo or roughly USD6-8 a kilo. Then I was thrilled that local growers started growing them and I bought as much as I could to do my small part to encourage local growers. The prices dropped to PHP250 a kilo and they were seasonally available due to being grown outdoors. Then big business got involved and like asparagus, we started growing capsicums by the ton or multiple tons in high-tech greenhouses under controlled conditions (often for export, with the dregs left to the local market). Sure, they were a bit tasteless and bland, but they were still pretty good. Suddenly, they were always available and the prices dropped to PHP120-150 a kilo, depending on where you bought them. Then mysteriously, about 2 months ago they all but disappeared from local markets. Did we have a capsicum plague? Did all of the growers simultaneously decided to take a two month break from growing the peppers? Does the world market not eat capsicum in July and August? WHAT? WHY? WHO KNOWS? WHY SHOULD I CARE? At any rate, they have suddenly reappeared and I got some nice yellow capsicums at about PHP250 a kilo last weekend, followed by some red ones at PHP200 a kilo at Market!Market! during the week, then red ones again at Rustanâ€™s grocery at just PHP145 a kilo the other day and today I saw them at the market at PHP220 a kilo. Obviously supply is restored, but pricing is a TOTALLY AT YOUR OWN RISK kinda thing. Go figure. Rustanâ€™s was the cheapest source. Hello MM. Ah feel ya! I no longer live in the PI but back when I did, I remember my colleagues’ amusement that I go all the way to Clark just to get rolls of Charmin. :) I can understand your frustration perfectly. It’s the same kind of shopping frustration I felt when I went back to Manila for a year after having lived in California for three. Am just curious…is Charmin TP imported? anything wrong with local TP? Re erratic supplies, isn’t this the case for most vegetables and fruits in the Philippines, whether capsicum, plums, or the indigenous varieties of fruits and vegetables. It’s a whole slew of problems from the lack of support for local farmers to the distribution system. It is so tragic that the Philippines cannot be self-sufficient even in the most basic food items. let’s see if one can send the propar signals to ‘fix’ the market system for fruit and veg. . .
Much too much has been said about Israeli hunger for land but we are talking of dessert here, parched and dessicated earth that they have turned to produce fruits and vegetables that youâ€™ll find in the shops of Europe within hours of picking. They have a plan and a distribution network that the Arabs do not have and you could plainly see this in the pathetic, wilted, dry and rotting produce just across flimsy fences that once separated them from Jewish farms. Long winding queues leading to rationed off toilet paper was an old though vivid and probably accurate propaganda against the inadequacies of â€œplanned economiesâ€ and at one time was mistakenly countered by the opposing side with a citation of the bread-lines that regularly form outside chez PoilÃ¢ne. i had to become a Sam’s wholesale club member so my boyfriend can purchase Charmin by the bulk. it’s the only tp he will use..my brother is in the military currently in Iraq, got a message to send Charmin….go figure! But I totally understand what you mean, especially in the supply of fresh produce. It seems you can’t get anything WHEN you actually want it. You’ll have to leave it to chance, and luck I guess. That way, you’ll be pleasantly surprised when you find good produce! I think this is the reason why we are so much happier than our supply-chain savvy brethren in the 1st world- you find good quality capsicums and it feels like you won the lottery!!! When I visited the country last December, I used Charmin TPs as packing materials. It seems that local TPs and paper napkins disintegrate easily. Wow, those prices are really expensive but then again, compared to prices of produce in Japan they are still cheap. You also pay premium prices in Hawaii especially lemons. In a farm nearby, plums .89/lbs and .39/lbs if you pick the fruits yourself and you could eat as much as your tummy could hold while picking, lol…. sorry! I enjoy your posts on Italian travel. Outstanding market/produce shots. Thanks for the insights, we are booked on a 12-day best of Italy Globus travel tour in October. My dear fellow Citizens and Countrymen, my heart goes to Juan dela Cruz who is the victim of the mendacious machinations of whoever wrote and approved the Constitution of the country and carries them out. Why isn’t good quality toilet paper available is the bigger question. I mean does it have to be Charmin which I assume is imported? agree..and it doesn’t stop at pricing. it’s the whole service consciousness thing. i say, enough of all the pinoy excitement at being the Guiness world record holder for the longest, the biggest, the widest whatever….i really don’t understand the penchant for record-holding. I just wish they’d spend the money on service consciousness training for ALL stockholders, owners and staff,(and their relatives) of all institutions – restaurants, malls,airlines, hospitals, palengkes, balut vendors, BIR, police, etc….as the comedian jimmy santos would say, “every all!”. consistently good service is bound to endear them to the locals, bring in more visitors and investors and get us in the record books faster than the longest, largest, widest balut penoy in the world. 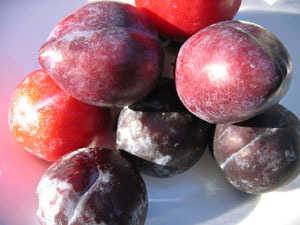 Bought plums yesterday at Landmark, the California brand also, and it’s at 170/kilo.. Also got nectarines at 180/kilo..